The second edition of FORKING SEATTLE, my independent guide to Seattle's restaurant scene and "food ecosystem" will be released on October 26th, 2018. List price for the 380-page trade paperback is $22.95. A Kindle edition will also be available for download at $9.99. I've included is a list of 21 "insanely delicious things you shouldn't miss" (for example: the oxtail pho at Ba Bar, the mousse of chicken livers at Le Pichet, Dinah's Cheese from Kurt Farm Shop, the lasagna bolognese at Mondello); 36 hidden neighborhood gems; another 36 top happy hour places; a dozen top steak houses; two dozen top Italian restaurants; and a broad selection of view and waterfront restaurants. 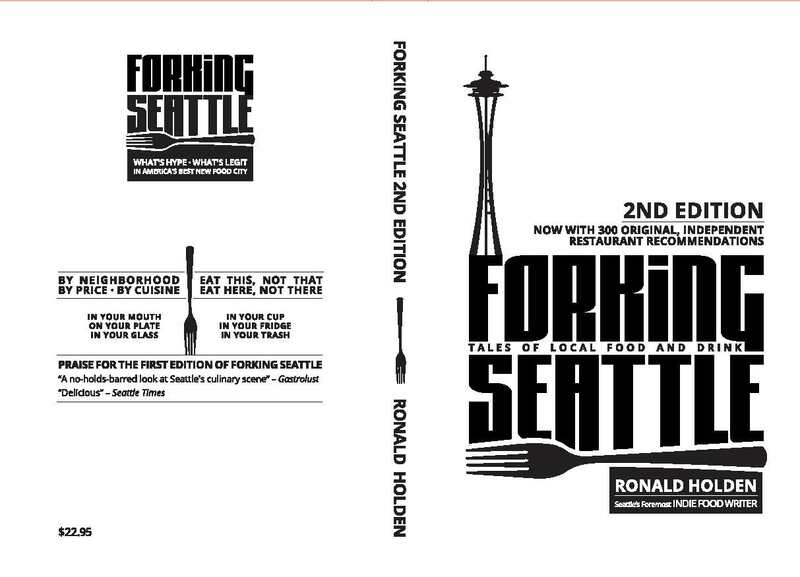 FORKING SEATTLE opens with a 36-page condensed history of key events in the development of Seattle's food scene. The time line covers almost 200 major mileposts like the first Starbucks (1971), the first Costco (1983), and the first Cinnabon (1985). But also less-known stories like the origins of the Seattle Dog (1988), the reason pho became so popular in Seattle, and the Pacific Northwest's politically fraught relationship with salmon habitat. The book will be a print-on-demand title through Kindle Direct Publishing, and available on Amazon.com as well as through regular retail outlets. This page contains a single entry by Cornichon published on October 11, 2018 11:00 PM. Drinks & apps with Joe & Jeff and Brian was the previous entry in this blog. Seattle Opera: These cute little kids are so screwed is the next entry in this blog.